Action Data Providers | Appracatappra, LLC. Additionally, Action Data Providers provide high-level Object Relationship Management(ORM) functionality using Action Codable controls and data models conforming to the ADDataTable protocol. static var tableName = "People"
static var primaryKey = "id"
static var tableName = "Groups"
Action Data Providers provide a subset of the full SQL query language (using SQLite’s syntax) to data sources that typically don’t natively understand SQL (such as JSON, XML and SPON). 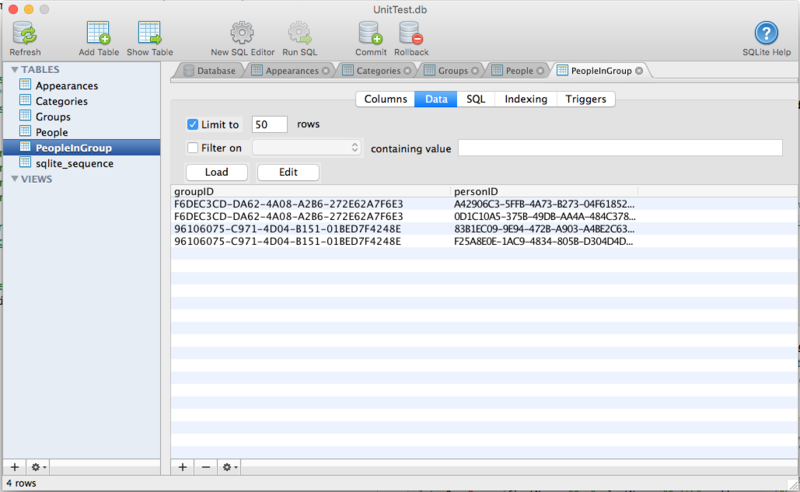 This allows the developer to work in SQL across data sources. Optionally, an Action Data Provider can be used with a set of Codable structures or classes to provide high-level Object Relationship Management (ORM) with the Data Provider handling adding, updating or deleting the backing records in the Data Source. The Action Data Providers are designed to be interchangeable, so you can start developing locally using a SQLite database and a ADSQLiteProvider, then later switch to CloudKit and a ADCloudKitProvider without have to change any of your other code. Additionally, Action Data Providers can be used to move data from one source to another. For example, download data from the web in JSON using a ADJSONProvider and save it to a local SQLite database using a ADSQLiteProvider, all with a minimal of code. Several of our Action Controls are designed to take an Action Data Provider as input (such as ActionTable), making it easy to work with complex data and common display and input methodologies that would typically require tons of repetitive, boilerplate code. Contains the elements shared across all Action Data Providers such as ADColumnSchema, ADTableSchema and ADCrossReference. Contains the enumerations shared across all Action Data Providers such as ADDataTableKeyType and ADDataProviderError. Contains the protocols shared across all Action Data Providers such as ADDataProvider, ADDataTable and ADDataCrossReference. The ADSQLiteProvider provides both light-weight, low-level access to data stored in a SQLite database and high-level access via a Object Relationship Management (ORM) model. Use provided functions to read and write data stored in a ADRecord format from and to the database using SQL statements directly. Optionally, pass a class instance conforming to the ADDataTable protocol to the ADSQLiteProvider and it will automatically handle reading, writing and deleting data as required. The ADSQLiteProvider will automatically create a SQL Table from a class instance if one does not already exist. In addition, ADSQLiteProvider contains routines to preregister or update the schema classes conforming to the ADDataTable protocol which will build or modify the database tables as required. The ADSPONProvider provides both light-weight, low-level access to data stored in a Swift Portable Object Notation (SPON) database and high-level access via a Object Relationship Management (ORM) model. Use provided functions to read and write data stored in a ADRecord format from and to the database using SQL statements directly. Optionally, pass a class instance conforming to the ADDataTable protocol to the ADSPONProvider and it will automatically handle reading, writing and deleting data as required. The ADSPONProvider will automatically create a SQL Table from a class instance if one does not already exist. In addition, ADSPONProvider contains routines to preregister or update the schema classes conforming to the ADDataTable protocol which will build or modify the database tables as required.